DSHG 3000 Handheld XRF Hazardous Elements Analyzer - Buy XRF Hazardous Elements Analyzer, Hazardous Elements Analyzer, Handheld Hazardous Elements Analyzer Product on Dshing Instrument Co.,Ltd. .For RoHS & hazardous elements testing of super huge articles. .For on-site testing of electronic components and parts. .For on-site random testing of various kinds of toys, stationeries, children’s products and gifts. .For packing material testing and verifying. .For various kinds of batteries hazardous substance testing and verifying. .For hazardous elements testing in cloth,shoes material etc. .For hazardous elements testing in electroplate liquids. .For hazardous elements testing in jewelry, ornaments etc. Due to the huge size of the analytes, it can not be tested by common desktop instrument. Now this problem has been solved by this handheld instrument. It can directly test on the surface of the analytes and the results are satisfying to customers. Because of various kinds of toys, it is impossible for repeated sampling in labs. Now this handheld analyzer is applied ofr on-site testing. Thus greatly reduces the production cycle. Because of the large sizes and large amounts of rinting ink, it is impossible for rapid & comprehensive testing with desktops. Now these problems can be solved by handheld analyzer. 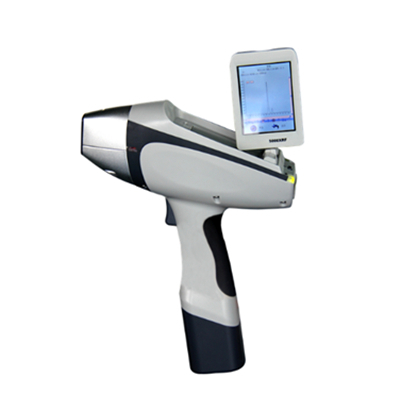 Compared to handheld X-ray fluorescence analyzer of the third generation,it is added the gas charging system, which can charge helium at ordinary pressure.Thus it can detect the elements from Mg, greatly expanded the detecting range of elements, satisfying the requirements of customers according to light elements detection. RoHS elements analyzer is installed with professional software.Brand new software interface and core, combined FP with EC, it has wider application fields.